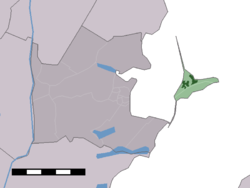 Top: location of the municipality of Waterland in North Holland and the Netherlands. Bottom: location of Marken in Waterland. 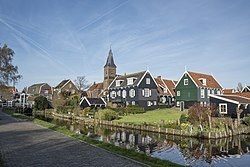 Marken (Dutch pronunciation: [ˈmɑrkə(n)]; Marken's dialect: Mereke) is a village in the municipality of Waterland in the province of North Holland, Netherlands. It had a population of 1,810 as of 2012 and is located in forms a peninsula in the Markermeer and was formerly an island in the Zuiderzee. The characteristic wooden houses of Marken are a tourist attraction. Marken was an island in the Zuiderzee. For some time during the later 19th and early 20th centuries, Marken and its inhabitants were the focus of considerable attention by folklorists, ethnographers and physical anthropologists, who regarded the small fishing town as a relic of the traditional native culture that was destined to disappear as the modernization of the Netherlands gained pace. Among them was Johann Friedrich Blumenbach who examined a skull from the island of humans which he called Batavus genuinus; and was the Belgian painter Xavier Mellery who stayed in Marken at the request of Charles De Coster. Mellery was asked to perform illustrative work and delivered several intimist works. The projects of Cornelis Lely was to incorporated the island into the Markerwaard. The dike, built in 1941 in the north, is the first phase of that project which was stopped by the war. In 1983, the Marker Museum about the history of the island was opened. Marken was a separate municipality until 1991, when it was merged into Waterland. Marken is located at 52°27′30″N 5°6′24″E﻿ / ﻿52.45833°N 5.10667°E﻿ / 52.45833; 5.10667 in the municipality of Waterland in the east of the province of North Holland in the west of the Netherlands. Marken is a peninsula in the Markermeer, of which is it is the namesake, and is connected to the mainland of North Holland by a causeway. In 2012, Marken had a population of 1,810 and a population density of 679/km2 (1,760/sq mi). ^ a b c (in Dutch) Kerncijfers wijken en buurten 2009-2012, Statline, Statistics Netherlands, 2014. Retrieved 19 August 2015. ^ (in Dutch) Zoekresultaten, Postcode.nl. Retrieved 19 August 2015. ^ (in Dutch) Netnummer zoeken, Telefoonboek.nl. Retrieved 19 August 2015. ^ (in Dutch) Geschiedenis van Marken, Marker Museum. Retrieved 19 August 2015. ^ H.W. Roodenburg, "Marken als relict: het samengaan van schilderkunst, toerisme, volkskunde en fysische antropologie rond 1900". Volkskundig Bulletin 25.2/3 (1999), 197-214. ^ (in Dutch) Het Marker Museum, Marker Museum. Retrieved 18 August 2015. Wikimedia Commons has media related to Marken. J. Kuyper, Gemeente Atlas van Nederland, 1865-1870, "Marken". Map of the former municipality, around 1868.